It has been cold and raining here in Los Angeles, and my skin is in great need of added moisture from head to toe. I have been layering my moisturizers beginning with a very nourishing oil and then topping it off with a richer cream in order to keep my skin soft and supple. 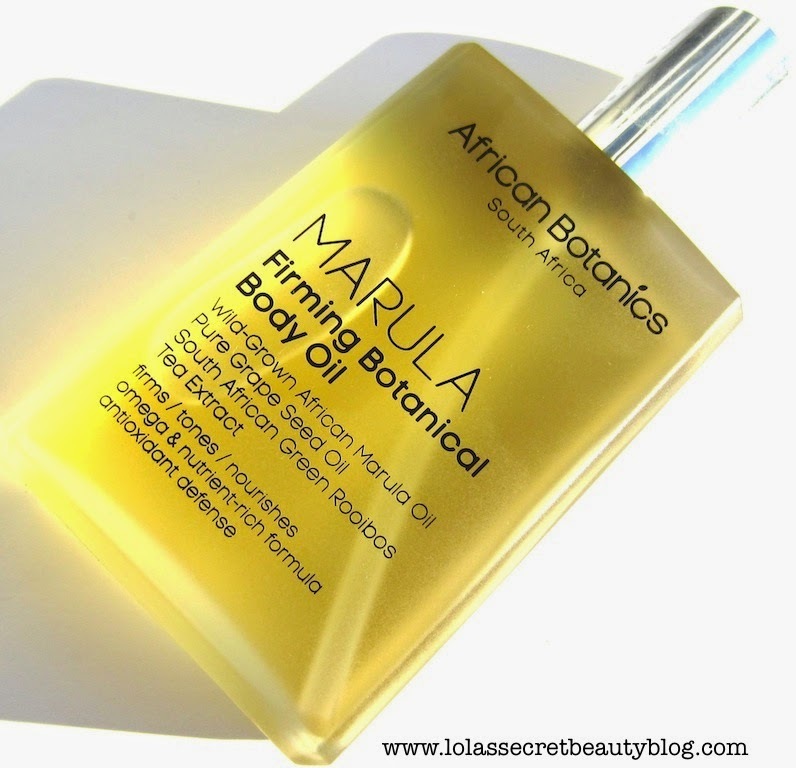 My current body oil obsession, unsurprisingly, is the African Botanics Marula Firming Botanical Body Oil. It is an antioxidant rich moisturizing and firming oil that makes my skin look and feel utterly amazing. I have said it before, and I will say it again, I'm pretty sure that African Botanics sprinkles all of their products with magical fairy dust. There is no other explanation as to why their products cast such spell over me. It is one of the very few lines that has caused me to fall madly in love with everything that I have tried. 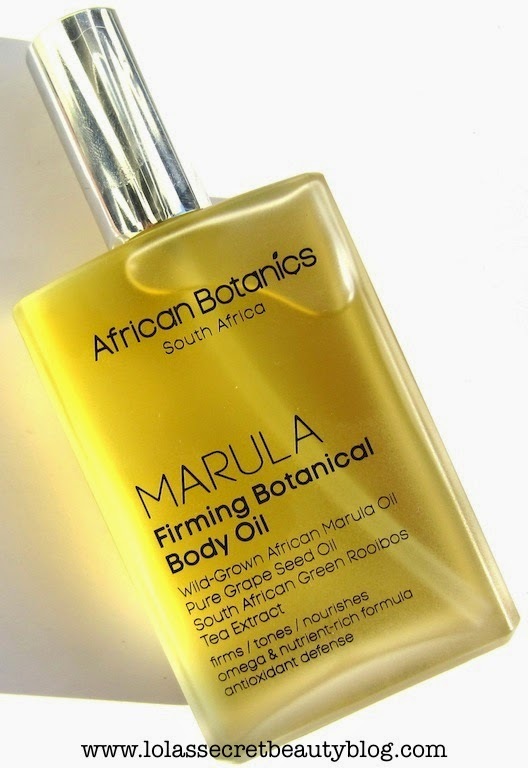 Marula Firming Botanical Body Oil is an intensive rejuvenating skin treatment that combines the firming and strengthening benefits of wild-harvested Marula and Pinotage Grape Seed oils especially selected for their targeted firming and toning properties. Light and sensual in texture, this cold-pressed blend provides corrective and preventative action against the main causes of loss of firmness: lack of elasticity, dryness, sun damage, slackening and skin ageing. Loaded with powerful antioxidants and Essential Fatty Acids. Rich in plant collagen, vitamins and nutrients that help restore flaccid, dry, photodamaged and lackluster skin to youthful firmness, tone and softness. This is essentially an incredibly luxurious, potent and ultra moisturizing antioxidant rich anti-aging oil serum for the body. The idea is to treat your body as you do your face to keep it moisturized, dewy, radiant and protected all year long. This is my very favorite body oil because it does so much more than simply moisturize the skin, but it also does an extraordinary job moisturizing. My skin is left deeply hydrated, luminous, lifted, firmed, toned, and more soft and supple than I could have imagined possible. The beautiful ethereal glow that my skin experiences is pretty breathtaking all by itself, and would be enough reason to use this oil religiously, but it does so many things for the skin simultaneously that it's hard to believe that so much can be achieved by one elegant bottle of oil. It has a light to medium weight consistency, and sinks into the skin quickly. I find it to be quite concentrated, but I am able to use even less since I prefer to apply it to warm and damp freshly cleansed skin. 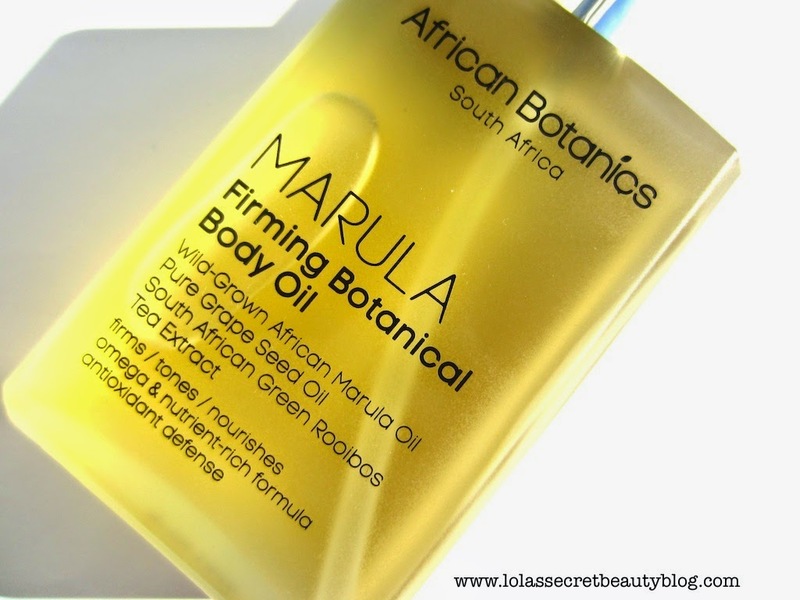 When my skin is feeling particularly dry, I apply African Botanics Marula Botanical Body Cream (reviewed here) on top of the Marula Oil, and the end result is velvety soft and supple skin that is deeply nourished and moisturized– no matter how cold it is outside. 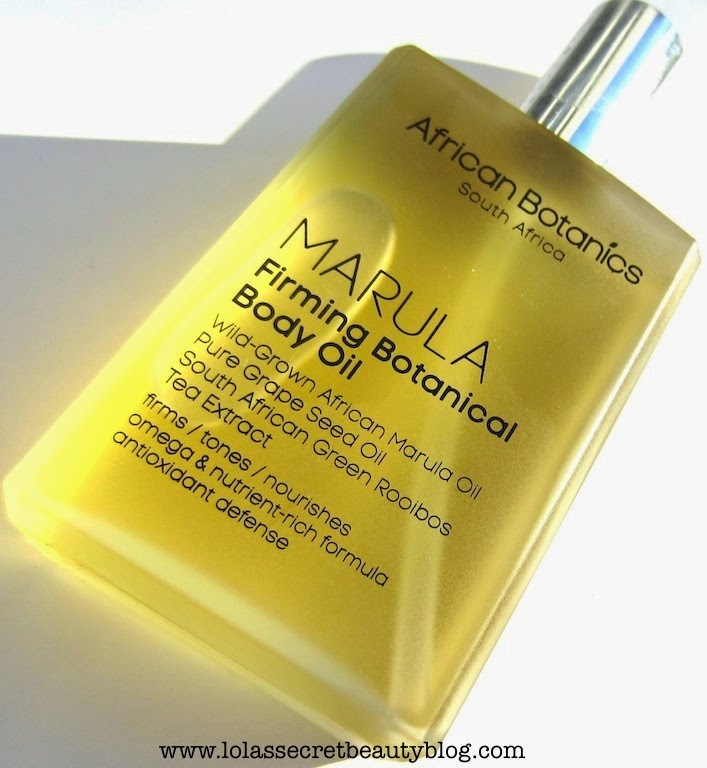 Using Marula Firming Botanical Body Oil is an amazing sensory experience because the oil itself is luxuriously silky to the touch, and because the scent is an intoxicating blend of African Botanicals. Crafted from wild African botanicals: South African Green Rooibos Tea and Honeybush plant. The scent is reminiscent of the Fynbos biome located at the southern tip of the African continent, the Western Cape Peninsula - fresh, grassy with a hint of honeyed base notes. As soon as it is applied, it creates a unique phyto-aromatic effect of freshness and wellbeing, the skin appears rejuvenated and firmer. Suggested use: "To restore suppleness, elasticity and tone, apply AM/PM. Smooth onto damp skin after a shower or bath. Massage with upward circular movements until absorbed to obtain velvety skin, boost circulation and oxygenate skin. Enjoy a pleasant and intense feeling of relaxation and well-being. Suitable for all skin types. For best results, exfoliate with Marula Detoxifying Salt & Sugar Body Scrub 1-2 times per week." Omegas, vitamins, nutirents and antioxidants restore skin's elasticity and firmness. Strengthens, moisturises and nourishes all skin types including dry and sensitive skin. 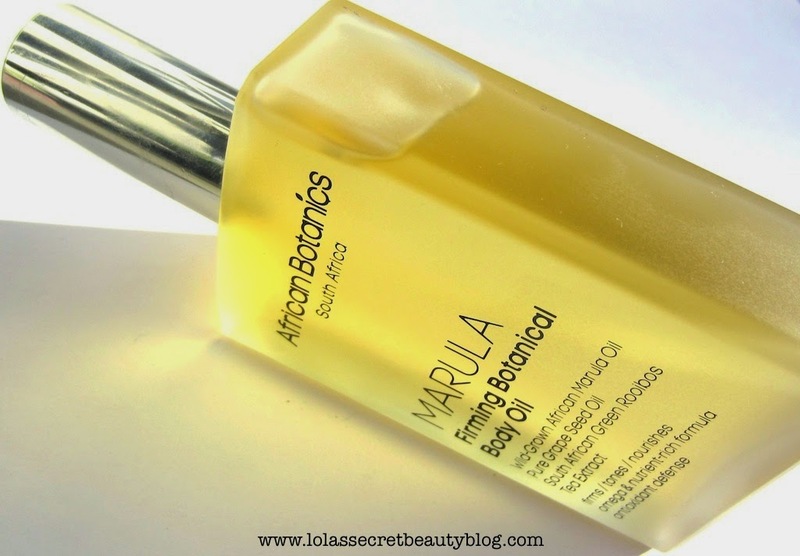 Marula Oil "is a cold pressed, weightless, anti-aging botanical oil sourced from the remote pristine areas of South Africa's Marula Belt. Considered one of Africa’s miracle oils. High in Vitamin E and Omega 6 & 9, this antioxidant-rich oil is traditionally used to reduce redness and transepidermal water loss, improve skin’s elasticity and firmness." Pinotage Grape Seed Oil is "harvested from organic grape vines in the Western Cape region of South Africa. Rich in polyphenols and contains high concentration of Omega 6 and Vitamin E which gives skin its nourishing and regenerating properties. It intensely nourishes dehydrated skin and offers an exceptionally smooth, soft and non-greasy finish." Ingredients: Sclerocarya Birrea (Marula Seed Oil)**, Vitis Vinifera (Grape Seed Oil)**, Aspalathus linearis (Green Rooibos Tea extract), Cyclopia (Honeybush extract). **Certified Organic. Formulated without mineral oil, silicone, synthetic fragrances, parabens, PEGs, PPGs, DEA, TEA, urea or phthalates. $70.00 for 3.4 oz. from African Botanics, Space NK US, Space NK UK, Beauty Bar, SkinStore.com, b-glowing, Beauty.com, Dermstore, SkinCareRX and Amazon (Affiliate Links). Yes, I need this. I am using my Musc Ravegeur body butter which I love mainly because of the scent. I love body oils but I usually have a conflicting relationship with them since their scent tends to compete with my perfume. I still haven't manage to return to face oils my darling. I am just really happy mi face is relatively ok that I don't want to push my own limits too much. I am currently using de Mamiel's salvation body oil--it smells divine and wears very close to the skin so I find I can wear any perfume with it. It is super moisturizing as well. I am wishing you, my dearest one, all the best for this 2015. To a TT line! To more excellent things to come for your blog! To a happy life with your furry ones! and to health, beauty, and youth! It's really lovely, and the scent does dissipate quickly enough that it shouldn't interfere with your glorious fragrances. I'm not sure that it wears as close to the skin as your de Mamiel's Salvation Body Oil, but ultimately it fades enough that you shouldn't have a problem with it. I think that it is wise that you are giving your skin a rest from face oils since your skin is finally starting to return to normal. …Speaking of oils…I did the Best of Luxury Oils post that you requested!!!! I know that you aren't using them right now, but at least you can see the what I think is truly extraordinary! Lola, Space NK had a special on an intro pack of this brand and it includes this body oil. Due to the small sample sizes, I am wondering whether there is any reason I could not apply this to my face as well? Hi Alison! I saw that in their sale section as well. It also includes the Pure Marula Oil which is specifically made for the face. I have never tried their body oil on my face, but generally body oils are made to address the needs of the body more than the face. I can ask the owners of African Botanics when they get back from their trip to South Africa. Face oils generally tend to have more potent concentrations of the ingredients used than body oils. That's a nice introductory kit to African Botanics, and their Intense Skin Repair Balm is one of my most beloved multipurpose skincare products! Happy New Year! I purchased the intro pack during this Space NK sale. I have decided I prefer the scent of their Neroli Infused face oil to that of the regular one in this kit. Planning to try the body oil tonight. Regarding the included Marula Intense Skin Repair Balm and Marula Muti Mud Mineral Body Scrub: Are these product supposed to be 'hard as rocks' in the containers? There doesn't seem to be any 'give' at all to even dip my finger into the jar. Thanks for any tips/advice.